Assets to be integrated to boost solutions for a smarter urban mobility. The ecosystem enlargement is an important step of Paradox Engineering’s growth strategy and reinforces its positioning as unique enabler of any kind of smart environment through compelling solutions for the Internet of Things era. Within this widened Smart City ecosystem, Tinynode will have the opportunity to further grow and leverage robust competences, technologies and market presence. “About one year ago we announced the availability of PE.AMI Parking Management solution, our off the shelf vertical application for managing parking in a smarter way. Thanks to the company proximity with Tinynode, we are now able to fast-track the development of sound urban mobility platforms and accelerate the adoption of future proof network infrastructures for any kind of smart service based on the Internet of Things”. “Tinynode aims at helping to create a smarter, safer, easier and more comfortable driving world, and we keep pushing to improve performance of our systems for vehicle detection”, adds Pierre Metrailler, CEO, Shockfish SA. 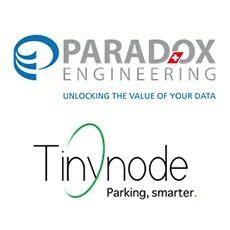 “We have been partnering with the best experts in signal processing, wireless and low power communication, and are now delighted to recognize in Paradox Engineering the unique competencies and synergies that are needed to boost Tinynode products and business development strategy, with the possibility to address new smart markets on a potential global scale”. PE.AMI is Paradox Engineering hybrid wireless/PLC mesh network multi-application platform, supporting multiple vertical services (from smart lighting to smart metering, from parking management to solid waste management, and many more) through a unique interoperable and highly scalable IPv6/6LoWPAN infrastructure, which really helps cities achieve their own goals in teams of greater liveability, improved environmental sustainability and public security, while at the same time supporting local economy. Based on open standards, PE.AMI does not impose any technological constraint, thus it enhances any kind of existing infrastructure safeguarding present and future investments.